The MAVEN spacecraft has completed the Periapsis Lowering Maneuvers necessary to place it into its 4.5 hour elliptical (150 km by 6,200 km) science mapping orbit around Mars. 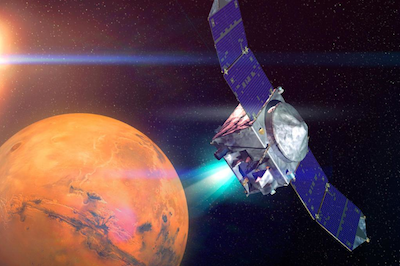 Five times during ‪#‎MAVEN‬’s one-year science mission it will make “deep dips” and descend to a periapsis altitude of 125 km (77.6 mi). At this altitude, ‪#‎Mars‬‘ atmosphere is about 30 times more dense than at MAVEN’s science mapping periapsis of 150 km. Many of the design features, algorithms, processes, and lessons-learned from previous Mars missions support MAVEN’s “deep dip” operations. One of these design features is MAVEN’s gull-wing solar panel design. The spacecraft’s solar panels are bent at a 20º angle. As MAVEN travels through the upper atmosphere, the air pressure will increase to a point that could disrupt flight dynamics if the solar panels were flat. MAVEN’s bent solar panels shift the center of air pressure away from the spacecraft’s center of gravity, providing a self-stabilizing configuration for atmospheric flight. The effect is similar to the self-stabilization provided by feathers on a badminton shuttlecock.